Description: FNEI mod. All recipes for items and usage for them. !!! Alpha version of the mod. !!! Search in English only. This mod will help you find all the recipes to create the selected item. Also you can see the use of the selected item. Last edited by _npo6ka_ on Fri Apr 19, 2019 2:26 pm, edited 63 times in total. I would like to hear your remarks, advice and wishes. This is going to make a lot of mods a lot easier to understand, especially those without dedicated English translations because of the formatting. This looks really neat, and you should be proud of it. I really like how clean the GUI is. If possible, anchor GUI panel on top-left instead of center, and move the recipe navigation to below the recipe name, so that the buttons don't move around when you click them. Xuerian wrote: Great work so far. This restriction api this game. Gui can only be created in the central screen. This problem can be solved using the static size of the recipe gui. _npo6ka_ wrote: This restriction api this game. Gui can only be created in the central screen. This problem can be solved using the static size of the recipe gui. I tinkered around with it myself and replaced all references to player.gui.center with player.gui.left and it works fine. Am I missing some side effect, problem, or other consideration? I also moved the buttons below the label and hid the other two labels. Looking forward to any further development either way. Edit: Went ahead and made a pull request with most of those changes. 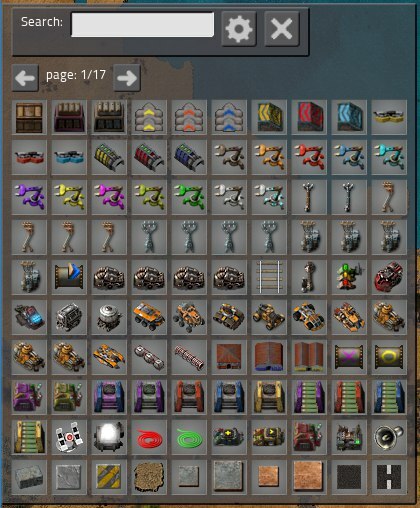 Great job on developing so much needed mod for Factorio, hope to see it get better and better with every update. One side note tho, as much as Shift+E sounds logical, bob's inserters already use it, so this early into creating your mod I'd consider switching to something else. Maybe Ctrl+E ? Gonna be testing it these days myself. Netoen wrote: Great job on developing so much needed mod for Factorio, hope to see it get better and better with every update. Thank you for your feedback. I will try to resolve this issue. It would be more logical if the hotkey at the bob inserters had a Shift + R, since the inserters rotate on the R key. I used a similar logic, we look at recipes using the help of the E key, so the search for recipes for the item should take place on the same key. Also, it would be lovely eventually to see ability to just minimize current recipe to side and/or get it pinned there. 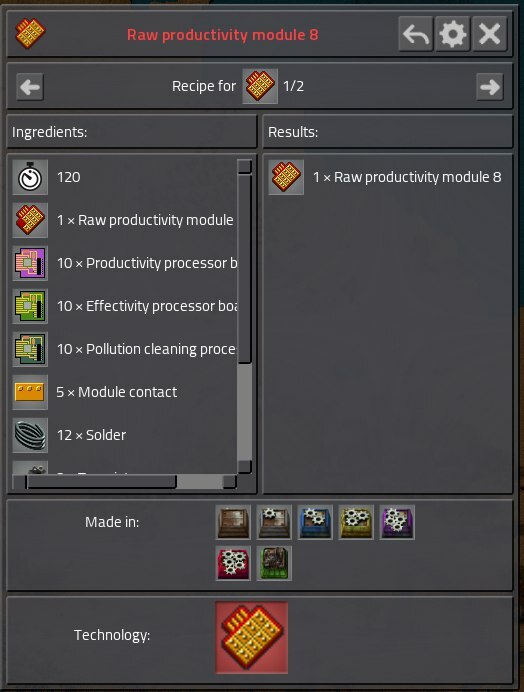 Another thing I would like to see - closing window with E is arguable, since I often want to craft things for the recipes I am viewing, say a furnace or electrolyzer. Aside from that, I myself always change "previous recipe" to Space rather than Backspace. Besides, in factorio it is shooting an enemy, so a safe to use. And after everthing is done feature like copying recipe into buffer so that I would paste it using Shift+LMB would make a world of difference. But still even now mod worth a lot. Thanx for your effort ! Lovely mod, works well and looks great everything you need for lots of recipes! Thanks! Some of the recipes displayed are completely unavailable for crafting. An example of this is the plastic bar recipes when playing with angels petrochem. Angels has removed the technology unlock for the regular plastic recipe, and added an unlock for its own liquid plastic recipe. 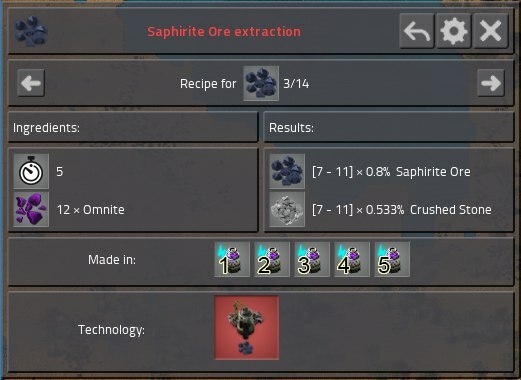 But FNEI still displays the regular coal -> plastic recipe, even though there is no way to unlock it. Perhaps FNEI should not display recipes which are disabled and have no technology unlock. Trainwreck wrote: Some of the recipes displayed are completely unavailable for crafting. An example of this is the plastic bar recipes when playing with angels petrochem. Angels has removed the technology unlock for the regular plastic recipe, and added an unlock for its own liquid plastic recipe. 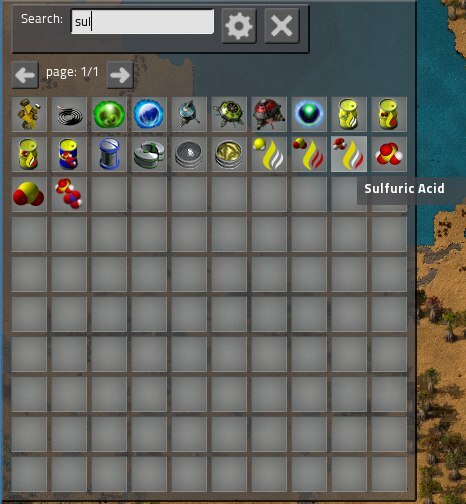 But FNEI still displays the regular coal -> plastic recipe, even though there is no way to unlock it. Perhaps FNEI should not display recipes which are disabled and have no technology unlock. Thank you for your report, fixed in 0.0.11 version! Thanks for the update, I noticed few unattainable recipes are still showing up with version 0.0.11. I believe the issue this time is that the technology itself has been disabled. Angels disables the base game oil processing technologies and adds a set of new technologies for its own processing setup. Trainwreck wrote: Thanks for the update, I noticed few unattainable recipes are still showing up with version 0.0.11. I believe the issue this time is that the technology itself has been disabled. Angels disables the base game oil processing technologies and adds a set of new technologies for its own processing setup. I will try to fix this problem. Now we have a lot of sorting lists of recipes and checking them with the settings. The game then desyncs, player 2 rejoins and FNEI is open on page 2, even though player 2 never clicked the scroll arrow. I had a brief skim through the FNEI source code, my guess is the fnei.rc.recipe_page variable needs to be stored per player. Really liked this mod on the other sandbox game and it's great to see it here, but I think you should come up with a more original name for it (unless you're the creator of the other one). Is a reverse recipe lookup possible? It would be very handy for beginners trying many of the complex mods to find their way. Thank you for your report. I'll try to fix the problem in the next update. FactorioParadox wrote: Really liked this mod on the other sandbox game and it's great to see it here, but I think you should come up with a more original name for it (unless you're the creator of the other one). I came up with this name for a few weeks. This name seemed the most original of all options.